I love walking Lily to school. I savor our walks, even during these cold, winter months. After the rush to get out the door — struggling with coats, gloves and hats for Emmy, Lily and myself — Lily and I hold hands and talk. We talk about her plans for the day, my plans for the day. The fifth grade crossing guard helps us cross the street while I hold the girls’ hands. On down the sidewalk we go. On snowy days, we say good morning to the man on the corner shoveling his sidewalk. We arrive at the school parking lot. A line of cars from both directions, turn signals blinking, stop for the P.E. teacher doubling as a traffic controller. We walk to the front of the school, and I wave to friends driving by. I kiss Lily goodbye, tell her to give her little sister a hug, and she trots off confidently through the front door. Even now, in January, my heart tugs to see my baby walk through those doors, a big Kindergartener. I joke with the P.E. teacher as we go back across the driveway. Emmy and I walk back on the opposite side of the street, talking about this and that. I see the retired couple, sitting in their bay window, reading the morning paper by the natural light. Further down the block, our neighbor is walking to morning mass. Emmy and I say good morning, we exchange pleasantries and go on our ways. Little things; routine things that happen every day. I appreciate these little things, the small joys of this walk to and from school. 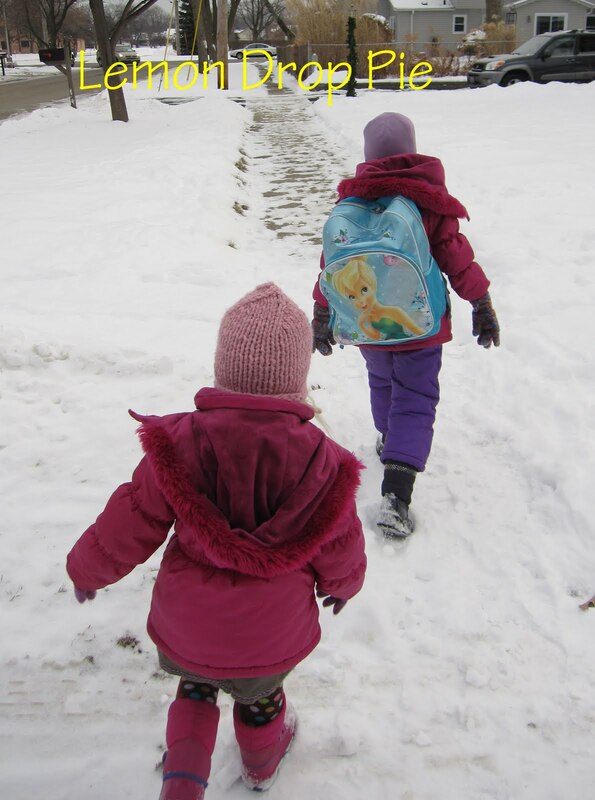 Some day soon, these walks will be just a memory; I will have to work and on the way drive the girls to school; eventually, the girls will grow up and take the bus to another school. Perhaps I am too sentimental; there is really nothing magical about these walks, nothing special. They are barely 10 minutes long, these walks, not even enough to count for exercise. I doubt Lily and Emmy will even remember these walks. Yet this mommy will remember these walks to school, the year Lily went to Kindergarten. Awwww. That is so sweet! I wish I could Gabriel to school, but the city owns the property where sidewalks should be and the speed limit is 40 so we aren't risking walking in the street. But awww…. I bet you see that line of cars and are convicted that you made right choice to walk! Basho would have written a haiku about the morning walk. Confused? Ask Lily. I think I must disagree – these walks you describe ARE something special, they ARE magical. Enjoy those special moments. I bet the girls might remember them too! Great post reminding us all to enjoy the little things in life. One more thing, I think you CAN count them as exercies too! ha. I like this post. It reminds me of quiet days when my oldest was a baby and toddler before his brother came along. We had our routine and each other. That time was gone in a flash, and I long for it once in a while. Enjoy those walks while you can. It's a special time of day just for the two of you! That sounds so lovely. What wonderful memories you're making! So sweet. I love your little walk, it sounds perfect. I can't remember if my mom walked with me but I remember walking with my children. I think it's very important to remember those things. But also the fact that you write it down and some day your daughter will read it is so precious. I don't think my Mum ever walked me to school, apart from my first day to some years. It was only a three minute walk anyway (I could see the school from my bedroom window).